Two week ago, I wrote an op-ed for CNN.com on Steve Bannon, the “alt-right” and white nationalism. It got the reaction I usually get when I write on CNN — passionate wishes for my speedy demise, helpful reminders that I am overweight and smell bad, and calls to my employer to fire me immediately. The most interesting response I received came from an alum of Williams College, the small college in western Massachusetts I graduated from. My op-ed raised questions for him, and he wanted to buy me lunch to talk about them if I was willing to dine with a Trump supporter. I was. Not only was he paying, but I’m acutely aware that I’m ideologically isolated and that I have almost no Trump supporters — or, perhaps, no _out_ Trump supporters — in my work and personal circles. We had lunch earlier this week, and we spent an hour getting to know each other — our families, our paths to the jobs we hold today, our feelings about our alma mater. Basically, we spent an hour becoming friends. I like the guy. I’m going to have lunch with him again, and I’m going to pay the next time. All of which made it harder to ask the question I needed to ask: Why Trump? My friend acknowledged that Trump is thin-skinned, erratic, blustery, abrasive, that he’s said and done things that were lewd, boorish and abusive, that he has grave doubts about his judgement. But Trump gives him hope on the one issue he cares about: immigration. The US has approximately 42 million immigrants, or 13.3% of the population, with roughly 1.2 million arriving per year. My friend would prefer we move to a much more restrictive set of immigration policies taking us towards net zero immigration. His reasons surprised me. “What happens to the wages of the average waiter in this restaurant if we end immigration. Labor is more scarce. Wages rise.” If we ended immigration, we’d take steps towards improving the lives of the underemployed and reducing inequality in the US, he argues. Good progressive that I am, I can think of a lot of other ways to reduce inequality and improve waiters’ lives: a livable wage law, single-payer healthcare, redistribution of wealth via a progressive income tax. I expected a fight over regulated and unregulated markets with my friend, but we ended up in a different place: a fundamental disagreement over who matters. My friend identifies as a “citizenist”, someone who believes our goal as Americans should be to better the lives of other American citizens. “I don’t care who they are, where they’re from, what they believe — if they’re here and they’re citizens, they’re the ones we should help.” I identify as a globalist. I consider it an accident of birth that I’m an American rather than Nigerian, and I don’t see a strong reason to privilege the economic success of someone who happened to be born here over that of someone who wants to come here. I have great sympathy for Lant Prichett’s argument that eliminating national boundaries would be the best possible step for global economic development. During my first year of college, I roomed with a devout Christian from a small town in Pennsylvania. We were both philosophy majors, we both loved to argue, and we became dear friends despite the fact that our worldviews diverged radically on many subjects. A few months into our friendship, we learned that certain of our arguments simply reduced to a fundamental moral disagreement that neither of us would budge from. Finding the roots of these disagreements was surprisingly satisfying — it allows you to look at someone you respect and say, “Oh, THAT’s why you believe that apparently absurd thing.” When my Trump-supporting friend and I reached the citizenist/globalist split, I feel like we’d found bottom in that way. I believe he’s fundamentally wrong, but I can see how he got from his underlying principles to his otherwise incomprehensible conclusion. My friend’s question for me was far more specific than why I opposed Trump. He quoted the final line of my CNN op-ed: “If we can’t agree that Richard Spencer and Steve Bannon are beyond the pale, what can we agree on?” Was it fair to put white supremacist Spencer and activist publisher Bannon in the same category?, my friend probed. And so, here it gets complicated. My friend and I agree that political dialog in the US is often too narrow. 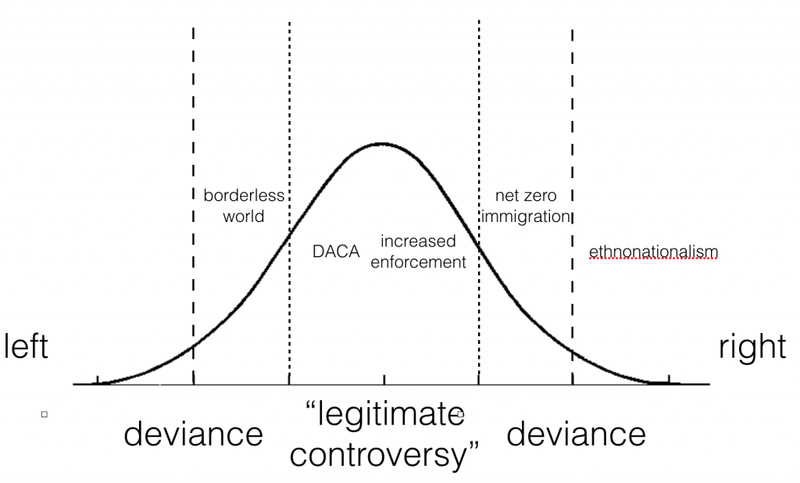 He’d like the sphere of legitimate controversy to include discussion of net-zero immigration. I’d like to see the dialog expand to include elimination of national borders. The rise of the internet as the dominant public sphere has led to an expansion of opinions we can encounter online, giving voice to perspectives that are still in the sphere of deviance for most media. For the most part, I think this is a good thing. My friend is with me… sort of. We both agree there’s points of view that we’re best not giving airtime to. But we’d draw the line differently. He wants to exclude “the guys in the sheets”. I propose a line that excludes Milo Yiannopoulos, who has promoted misogynistic bullying online during Gamergate, but my friend is a reader and fan of Milo. And the more I talk about the issue with him, the more I realize I’m uncomfortable both with where that line should be placed and, more broadly, with placing lines. Psychology professor Peter Coleman wrote a book called The Five Percent about apparently intractable conflicts. One of the key stories he explores is tension between pro-choice and pro-life activists in Boston. In 1994, John Salvi III opened fire in two abortion clinics in Brookline, MA, killing two and wounding five. Coleman describes how a group of six women, some ardently pro-life and others ardently pro-choice, began meeting in secret over the course of six years. Over the years, the women became deeply fond of one another. But rather than coming to agreement on issues of abortion, they became more polarized over time. Through years of explaining their positions respectfully to someone who deeply disagreed with them, the women became stronger and clearer in their convictions. Is this a success or a failure? If you’re in the camp that believes that careful, fact-based deliberation leads to compromise and new solutions, it’s disappointing. But for Dr. Coleman, this is as good as we could hope for. The vitriol and anger that characterized the dialog between these two groups evaporated as these core activists began to know each other as people. And this may be the best we can hope for with controversies that reduce to fundamental conflicts of values. Sitting down with my friend was made easier by the fact that we have a lot in common. We’re both hyper-privileged white males, we had enough time and flexibility to schedule the conversation, we both felt comfortable in the setting he’d chosen for the conversation. We had a great deal of common experience through our time at the same college. Neither of us felt personally threatened by recent political events in the way an undocumented immigrant or a Muslim American might. And even with all this going for us, it wasn’t an easy conversation — we circled around it for an hour before diving into it. At this point, my friend isn’t comfortable revealing his identity, for fear that being identified as a Trump supporter will hurt his chances at working in academia. That, too, is an obstacle to these conversations, and some of that blame goes to me and friends on the left who are working to ensure that no one believes that President Trump has the approval of a citizenry united behind him. But I’m looking for ways to fight the excesses candidate Trump has promised while finding a way to keep open dialog with the people who supported him. Postscript: I talked through the diagram I offered above with my friend and colleague Nathan Matias. He noted that, while helpful, the diagram does little to shed light on the current question d’jour: fake news. He’s right. The diagram above presumes good faith, and much of the media that’s created around the 2016 presidential election was not disseminated in good faith. Stories in good faith often work to push the boundaries of the sphere of legitimate controversy. As a result, they make some people uncomfortable, since they bring in perspectives and views we’re not comfortable entertaining. But that’s different from two categories of news that are being lumped into the idea of “fake news”. Some “fake news” is propaganda. It’s weaponized text, designed to make our side look good and the other side look bad. Much propaganda isn’t fake — it’s simply heavily biased, and offers an incomplete view of events to have a persuasive effect. The medium term effect of propaganda is polarization, as we stop seeing our political opponents as reasonable people we disagree with, but as people who are so wrong and misguided that we couldn’t possibly find common ground with them. In the long term, propaganda destroys democracy, because it silences dissent and calcifies the parties currently in power. A small amount of “fake news” is better described as disinformatzya. Its goal is not to persuade readers of its truth so much as it attempts to raise doubt in the reader that anything is true. We’re not used to disinformatzya in the US, but it’s been quite common not only in Russia but in Turkey, where Erdogan has manufactured fake news designed to reduce Turkish trust in Twitter, trying to disable it as a vehicle for organized opposition to his leadership. The long-term effect of disinformatzya is reduced faith in institutions of all sorts: the press in particular, but government, banks, NGOs, etc. Who benefits from this doubt? People who already have power benefit from a population that’s disempowered, frustrated, confused. And highly charismatic leaders who promise guidance away from failed institutions benefit personally from this mistrust. My friend and I didn’t directly engage with issues of propaganda and disinformatzya versus boundary-pushing in good faith, but the subject came up more than once by accident. Trying to demonstrate Breitbart’s pushing of subjects beyond the pale, I referenced an article, “Are Jews White?”… which of course proves to be an Atlantic article asking questions about whether Breitbart is raising questions like this, not an actual Breitbart article. Yep, I’m a communications scholar, and I’m still susceptible to confirmation bias. NB: I asked my friend to review my blog post and offer corrections and clarifications to ensure that I’m portraying him fairly. This post reflects his corrections and amendments. Originally published at … My heart’s in Accra.